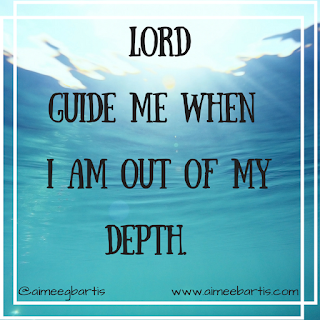 What do you do when you're out of your depth? I mean seriously in over your head? Being a technology teacher, I'm frequently out of my depth with new technologies. For example, I took on video announcements this year. Our school had never done them. I was comfy with Google Hang Outs on Air. Then Google discontinued them and the new solution was very complicated. No problem, I took to YouTube and figured most of it out. I do have one lingering problem but I'm working on it. With the older boys, I have plenty of friends who have boys their ages and older. I have my mom and sister to get advice from as well. I can send a text or make a phone call and get good solid advice in a matter of minutes. But, as usual, B man is a different story. I have a few friends who have autistic kids but every autistic kid is so different so that's hard. The past few weeks I've become convinced that I will VERY quickly be out of my depth with B man. Sunday morning he asked Sam, "Sam do you know the 3 types of irony?" Then proceeded to teach us the three types of irony. Of course, I learned something. B loves to watch TED-Ed. That's where he learned about irony and figurative language. He apparently also learned about Ghandi. On the way to Michael's (to get resin because every 8 year old needs resin) Saturday I was listening to a podcast in the car, I think it was Science vs. Zika (yes, I'm that nerdy). When it was over, he said "Can we listen to one about Ghandi?" I asked him what he knew about Ghandi. "He was brown and he was a peacemaker. He lived in India." I searched iTunes for a podcast about Ghandi. As we listened to it, I wondered...how long before he asks me about something I know nothing about? Perhaps tomorrow. But definitely by the end of next week. What does he know? What's inside that brain? How smart is he? We have no idea. He has not been able to handle any testing situation he's ever been in. His original testing at Children's. His 3 year re-evaluation. I think he actually hit one of the ladies testing him then. Occupational Therapy evaluation last week - he ran out of the office, out of the building and into the parking lot. It's hard to know when he'll out run us. I have no idea what we'll do when we get there. But I know the One who knows. All I can do is keep praying. Keep asking the LORD to steer me in the right direction. Keep praying for wisdom to be the best momma for all three of my boys. Keep listening to the people he brings me.